The Bayer Young Environmental Envoy Programme invites applications from young Indian environmentalists working to protect nature and promote sustainable development. Selected students will be invited to fully funded weeklong study tour to Germany to experience how environmental protection is practiced by people, government and industry there. The study tour will also take to the students to the global headquarters of the Bayer Group in Germany and demonstrate how companies – through product development and responsible manufacturing processes – are contributing to sustainable development. If you are passionate about the environment and are working towards it, all you need to do is to conceptualize and send in your project details to Bayer. 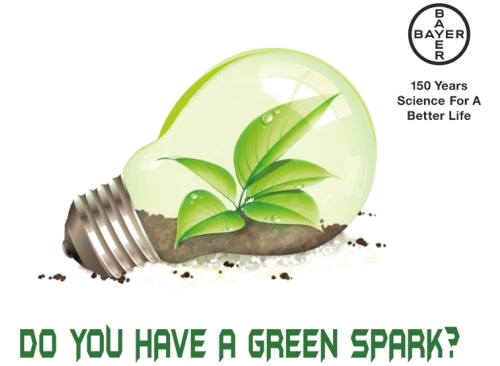 You could represent India as a Bayer Young Environmental Envoy in 2013 and join the next batch of global envoys to Germany on an all expenses paid trip from November 10-15, 2013. For further information and to apply, click here to download the application form.